The new Alfamarine 60 built by the Fazioli Yard is an open yacht that includes in a perfect, complete and essential way, all the winning characteristics that this type of boat offers a sporty and demanding clientele. These winning characteristics, are the indispensable condition to have access to a pleasure yachting market where facts are more important than words. 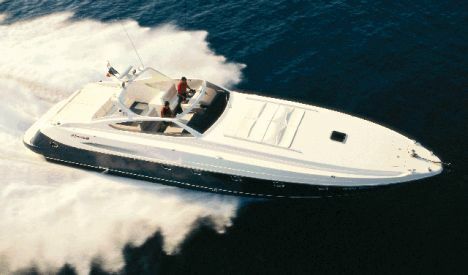 Her main features are excellent performance, very good stability, comfortable cockpit and first-class interior finishing. 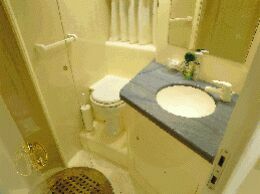 Comfort and privacy make us forget that actually we are on an open-deck boat. Alfamarine 60's striking characteristics are confirmed by the following data: 49-knot speed as indicated by the GPS with 2,300hp MTU engines and Arneson drive, cockpit with very wide dinette, large sunning area and garage with hydro-electric hinged transom for the tender. 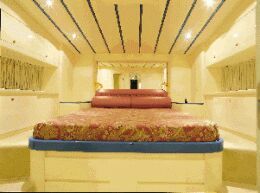 In addition, she is fitted with hydro-electric gangway, recessed hydro-electric swimming ladder in the aft platform, double access steps to the cockpit, three staterooms, three bathrooms, main salon with galley and dinette. In order to complete the above-mentioned, summarized notes and to address the reader to observe the images that perfectly describe the yacht, we would like to point out to the fact that performance, stability and balance are what most impressed and astonished us. Is she an open boat that meets the demands of the clientele? Alfamarine 60 does not "meet" the demand, she "is" the answer. Draft from lower tip of propellers: 5'3"
Notes: 3x1.200 hp Man engines may be requested for a maximum speed of 60 knots. 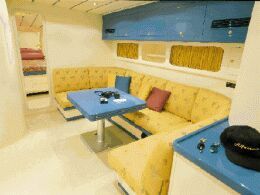 Cockpit arrangements and fittings: helm station with pilot's and co-pilot's settees for 2+2 passengers, U-shaped settee with table, aft sunning area and aft transom garage with hydro- electric opening, 2 access ladders to the aft platform, 2 mooring cleats with mooring winches, shower and dockside electric connection, hydro-electric operated gangway. Aft platform is fitted with a hydro-electric swimming ladder and lockers. Superstructures and windows materials: fiberglass and Plexiglas. Galley: the recessed galley is on a side of the salon. 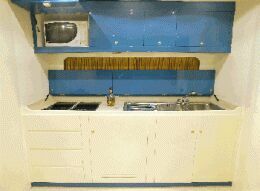 It includes lockers and cabinets, worktops, four ceramic hobs, oven, refrigerator, freezer and double sink. Standard fittings: in addition to the above-mentioned fittings, standard fittings include air conditioning plant, 12 kW generator, Hi-fi stereo, 2 color TV sets. Electrical switchboard and plants: the electrical panel is located under the companionway, an original yet functional position.